Snow Joe knows how to make great snow blowers for homeowners. The Snow Joe Ultra SJ625E is a great snow blower that has proven itself to be reliable, robust, efficient and most importantly — affordable. This snow blower won’t leave you in the poor house, and I promise you that it will soon be your beloved friend when the snow starts to fall. Knowing that you’re prepared to handle a heavy snowfall brings a comforting confidence to your ego — at least it does for me. I don’t like to be caught off guard. Having the Snow Joe SJ625E sitting your garage will make you feel better when a winter storm is looming on the horizon. A wonderful set of features. Nice wide clearing area. The problem is that most people wait until a snowstorm has blanketed their neighborhood before purchasing a snow thrower. Unfortunately, it’s usually too late to buy one at that point because everyone panics and heads off to the local Home Depot to buy a snow blower — and they’re usually all gone by that point. Local stores can only stock so many snow blowers. This is a new model and a refined version of the Snow Joe SJ624E Ultra. As with any product, every year popular products are improved by the manufacturer. For example, Apple updates their smartphones every year in order to evolve the technology, ultimately creating a better product for consumers. In this case, Snow Joe has made improvements to the overall design and efficiency of components SJ624E, which they are now calling the Snow Joe SJ625E Ultra. These YakTrax are essential to preventing accidental falls in winter. And, if quality enhancements doesn’t get you excited, you’ll be happy to know that they’ve also reduced the price of this snow blower. Overall, this is a fantastic choice for homeowners. If you’re looking for a lightweight, easy-to-use snow blower for this winter, then this should be at the top of your list. It’s best suited for handling snow up to 8″ in depth. View or download the MANUAL for the Snow Joe SJ625E Ultra. To understand how to choose the right extension cord, read our guide. But, the Coleman 02589 is our recommendation for a proper extension core. You need a minimum 12 gauge cord, but a 10 gauge cord would be a better choice if you decide to use a 100-foot cord. Why? It will allow electricity to flow more readily thus producing less heat and protecting your electrical components on the snow blower. Extension cords do matter. Most people are unaware of the reasons why. It’s better to have a long extension cord when clearing snow. the Snow Joe Ultra features an adjustable discharge chute that rotates a complete 180º to provide full control over the direction of the snow stream. The chute deflector can also be adjusted to control the height of the snow stream. Easy-glide all-terrain wheels make the Snow Joe Ultra easy to turn and maneuver with each pass. The scraper blade at the base of the unit efficiently scrapes the snow clear to the ground without damaging your deck or pavement. Powered electrically, the Snow Joe Ultra SJ625E is effortless to start and maintain. No gas, oil, or tune-ups are necessary. The unit is ETL-approved and carries a full two year warranty. For heavier snowfall on mid-sized driveways and walkways, the Snow Joe SJ625E Ultra is your snow solution this winter. The LED light is handy for night time snow clearing. You can find more information in the manual. Keep the area of operation free of foreign objects that can become thrown by the rotor blades. Perform a thorough inspection of the area since some objects may be hidden from view by surrounding snow. If the snow thrower hits an obstruction or picks up a foreign object during use, stop the snow thrower, disconnect the extension cord, remove the obstruction and inspect the unit for damage. Repair or replace any damaged part before restarting and operating the unit. Keep children, pets and bystanders away from the area of operation. Be aware that the normal noise of the machine when turned on may make it difficult for you to hear approaching people. Start your clearing path near the electrical outlet and work outward, throwing snow in a back and forth motion. To clear in the opposite direction, step over the cord and pivot the snow thrower on its wheels. Make sure to overlap clearing paths. Note the wind direction. If possible, move in the same direction as the wind so that the snow is not thrown against the wind (and thus back into your face and onto the just-cleared path). While moving the snow thrower, do not drag the power cable violently or roughly. The snow thrower should move within the range that the cable can safely reach. Do not push the snow thrower with excessive force. You should push the machine gently and evenly in accordance with the unit’s throw rate. Do not apply additional man-made load to the engine since this may cause engine damage. Some parts of the snow thrower may freeze under extreme temperature conditions. Do not attempt to operate the snow thrower with frozen parts. If the parts freeze while the snow thrower is in use, stop the snow thrower, unplug the extension cord and inspect for frozen parts. Free all parts before restarting or operating the snow thrower. Never force controls that have frozen. When working on pebbles, gravel or unpaved surfaces, avoid throwing loose surface material along with the snow by pushing down on the handle to raise the scraper bar at the base of the unit above the pebbles or gravel. For larger areas, a definite pattern of operation is required to thoroughly clean an area of snow. These patterns will avoid throwing snow in unwanted places, a well as eliminate the need for a second removal of snow (Fig. 18). Pattern A: Throw the snow to the right or left side where it is possible. For areas such as a long driveway, it is advantageous to start in the middle. Plow from one end to the other, throwing snow to both sides. Pattern B: If the snow can only be thrown to one side of the area to be cleared, start on the opposite side. We do our best to cover all the best products and save you time on research. Let’s face it, managing an extension cord can be annoying. If you get excited by a completely cordless snow blower then you might want to consider the Snow Joe iON21SB-PRO. 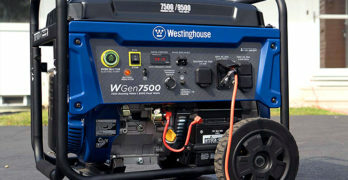 It’s powered by a 40V lithium-ion battery that should enable you to clear snow for about 45 minutes on a single charge. It’s more expensive, so it’s not for everyone, but still a quality snow blower. 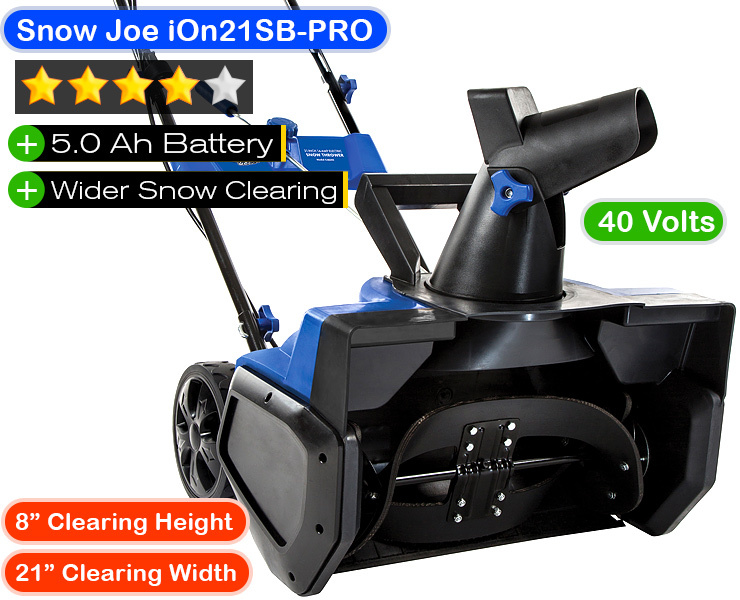 If you have a small yard then you can save some money and buy the Snow Joe iON21SB, which has a clearing width of 18″ (not 21″). Other than that, it’s identical, and less expensive. Read our in-depth review of both of these snow blowers to understand the differences and gain more insight into their snow clearing capabilities. ✓TIP: Wear proper clothing when using your snow blower. Don’t wear loose clothing or jewelry that may become caught in the machine. Protective headgear or a hat will keep hair away from revolving parts. 40 V 5.0 Ah EcoSharp PRO rechargeable lithium-ion battery provides up to 65 minutes of whisper-quiet run-time and is compatible with all iON tools. Powerful 600 Watt brushless motor increases battery efficiency, maximizes motor performance, decreases noise and vibration and extends motor life. Battery power tools are expensive. Hopefully, one day that will change.